“There may be a security camera aboard that is capable of recording any activity.” —notice on a CTA bus. What is the “activity”? The following is the story I wrote in response to the prompt. I ended up liking the story I wrote and I plan to expand it into a larger story. He sprayed that stuff that looks like silly string over the train car’s camera. Ever since he heard about what happened to his friend, Jesse, he’s been extremely paranoid every time he enters a CTA vehicle. At first, he thought the stories on the internet were exaggerated and for the most part, untrue, until it happened to his friend. Jesse is lying in a hospital bed because of severe burns and moderate nerve damage due to the electrocution. Nobody knows what he did, but everyone knows he got punished for it. That’s the thing; nobody knows what activities you can’t do besides the obvious—smoking, drinking, eating, and playing loud music. A man named Joe was electrocuted for putting his arm around another man. Lucy got electrocuted for rolling a joint. Caro got electrocuted because she gave a homeless man some change. Now Jesse. Who knows what he did to warrant such horrific damage? The train cars were mostly empty today. People are probably too afraid to ride, not knowing what was permissible. He didn’t know if the cameras were the only action sensors, but he knew that they definitely played a large role. Who was ultimately watching the passengers? It was rumored that the country’s public transportation systems now had NSA-like capabilities, just on a smaller scale. He sat down and shoved the can that sprays stuff that looks like silly string inside his hoodie. He sat motionless, looking out the window to the desolate and rundown nature that consumed his city. He smelled strong perfume, coming from the only other person on the train, a woman sitting at the other end. “Why don’t they electrocute her and her rank perfume? They need a sense of smell,” he thought. After forty minutes of sitting like a stiff board and a short walk, he entered the hospital. “Jesse, room 202.” They told him he couldn’t see Jesse, that Jesse was under arrest and in police custody. Nobody could see him. “Can you tell me where the bathroom is?” Down the hall and to the left, he went. He ran into an elevator that was just closing and took it to the second floor. The doors opened and there was an armed guard standing at the entrance. The guard stopped him and asked where he was going. He went back into the elevator and left the hospital. He couldn’t believe this nonsense. What did Jesse do? He was confused, but he knew he had to get Jesse out of there. He resolved to make a plan while walking the twenty miles home. Find the Light, Follow the Truth, & Never Give Up. 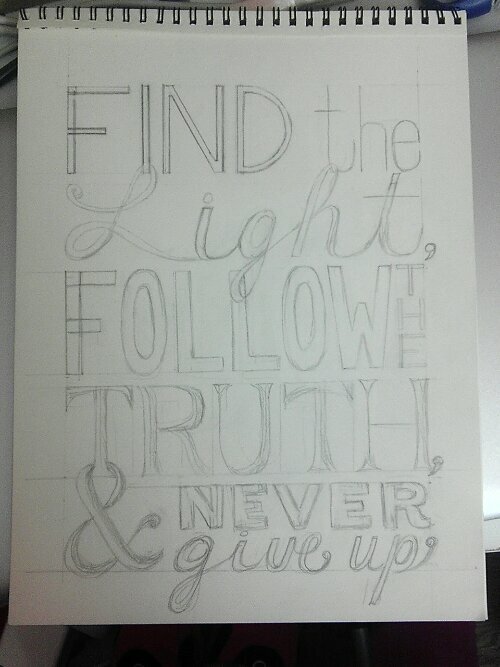 I wanted to make something special for a friend, so I thought of a nice, inspiring phrase and sketched it out. I made some mistakes while darkening the letters and tried to amend it, but I only made it worse. I pretty much blame my carelessness on the fact that I was watching “Sherlock” while drawing and my normally extreme attention to detail was diminished by my inability to tear myself away from the hilarious and insulting nature of Sherlock’s wit. I think I will redo this one, but here is a look anyway.